The 2013 Post Falls Reverse Job Fair was attended by 218 students. Hundreds of high school seniors received a real-world introduction to employment and job search techniques in Post Falls this spring. At Post Falls High School, students prepare for the Chamber of Commerce’s annual Reverse Job Fair throughout the school year – researching careers and colleges, job shadowing and creating portfolios filled with work-related documents, explains Post Falls High School English teacher Jennifer Maddy. The students also engage in practice interviews and create tri-fold posters in final preparation for the fair. “It blows me away every year,” said interviewer and judge, David Risdon, CEO of Century Publishing in Post Falls. Risdon – involved with the fair since its inception in 2007 – says he is impressed by each student’s potential and likes seeing how well the students prepare for the fair. “The kids have dreams and are ready to go after them,” he said. Students are interviewed by professionals in their chosen career. Popular careers this year included physical therapist, nurse, lineman, welder and auto/diesel mechanic. Nearly 200 business people volunteered as interviewers this year. “The businesses professionals get as much out of the event as the kids do,” Risdon said. Students enjoy the process of getting dressed up and having the opportunity to meet individuals from their desired career, Maddy said. “I believe it provides them with growth in spirit from working hard, feeling uncomfortable, but accomplishing the challenge. It’s invaluable experience for these young adults,” she said. Ten scholarships totaling $6,500 were awarded in connection with the fair. 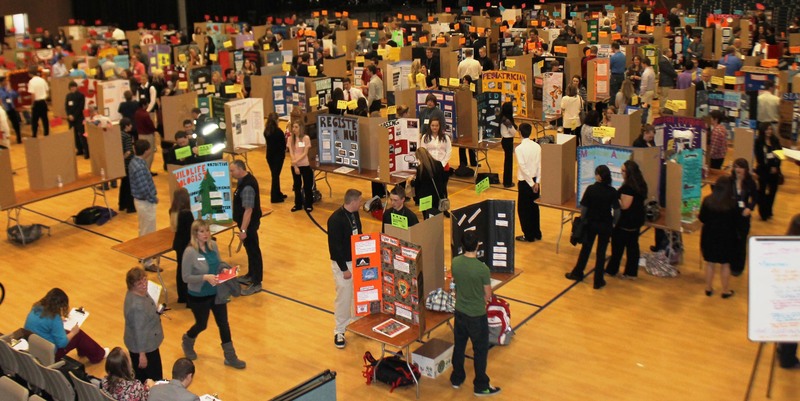 The day before the fair, a team of judges reviewed and rated all student portfolios and posters. The top 25 finalists were interviewed by judges during the fair. They were scored on their verbal communication, non-verbal communication, professional enthusiasm and dress. This entry was posted in Employers, Students and tagged idaho department of labor, job skills, Post Falls, Reverse Job Fair, students on April 25, 2013 by Idaho Department of Labor.